Extra Virgin Organic Olive Oil (Olea Europaea) - Sweetgrass&Rain Inc. Cold Pressed Extra-Virgin Olive Oil is very high in vitamins and a wide variety of fatty acids. Cold Pressed Extra-Virgin Olive Oil is used predominantly in cooking, and in the making of cosmetics and soaps, especially Castile soap. 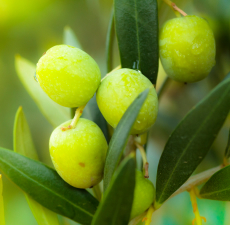 Olive Oil has been popular in the Mediterranean for skin-care and beauty products since ancient times and aids with the re-hydration of dry, mature skin and hair.